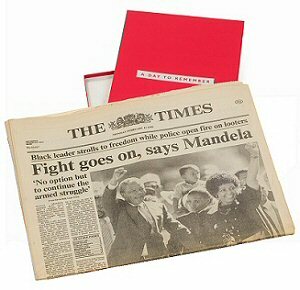 Original BRITISH Newspapers (not copies) from a date of your choice. The ideal gift to Commemorate a Birthday, Wedding Anniversary or other Special Occasion. Original issue of a newspaper bearing the same date as someones birthday, anniversary or other memorable event. We do mean original, not reproduction. 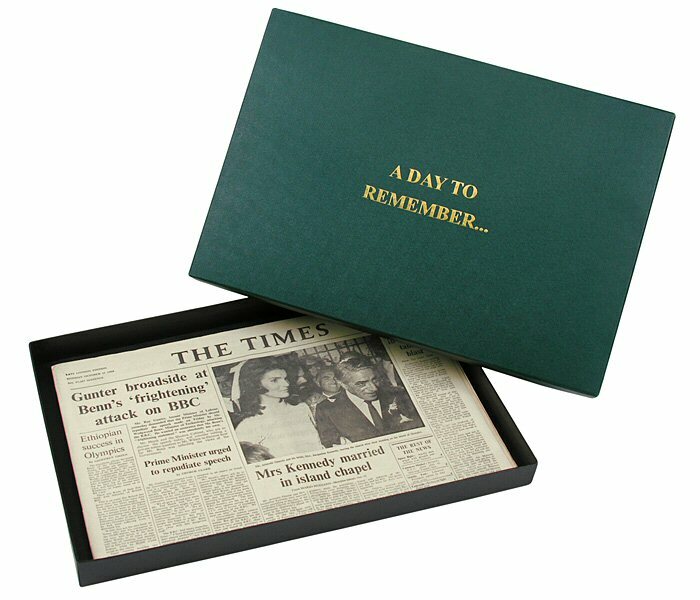 Each newspaper is a carefully preserved archive item packaged in an attractive presentation box - a treasured gift and unique collectible, evoking the style and mood of the era. 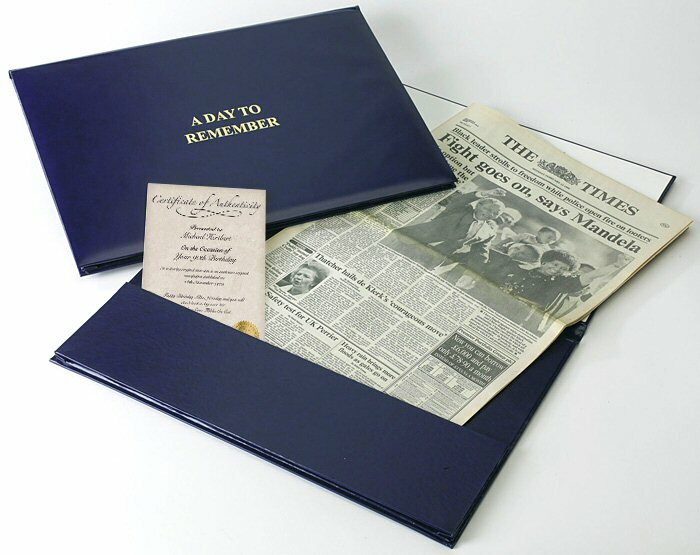 Drawing from the UK's largest newspaper archive, we can supply a complete major UK national Newspaper title from virtually any day over the last 100 years. 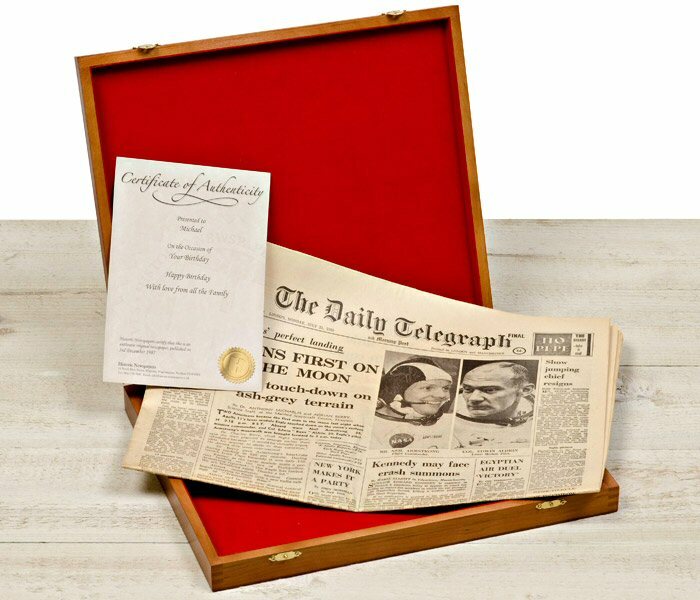 While we cannot guarantee that your paper will be a specific name (eg The Times), we can ensure that you receive a British national daily broadsheet (ie similar large format) newspaper. The only exception to this is if you choose one of the small number of dates that mark an important historical moment in history (eg First Man on the Moon), as these versions have a uniquely-high collectable value. When you submit your date below, we make an automatic online check of availability, and make approriate suggestions. Note: SUNDAY newspapers incur an addtional charge of £20. 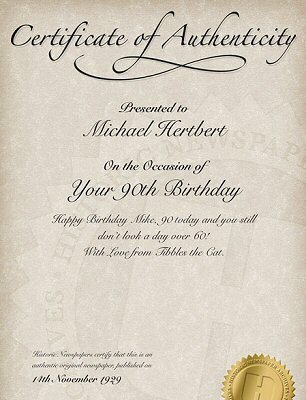 At no extra charge, your orignal newspaper comes with a certificate authenticating its originality. Please fill in the form above to personalise your Certficiate of Authenticity. If you do not wish to personalise the certificate, then just leave these fields blank. 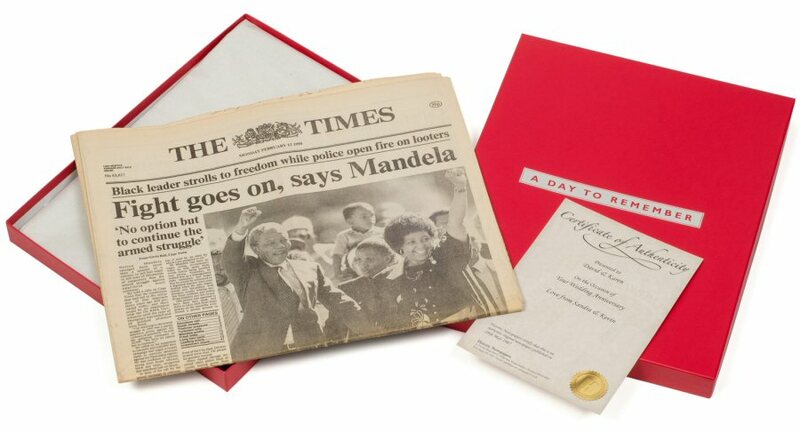 Occasion: This is the text that appears after "On the Occasion of" on the Certificate (eg. 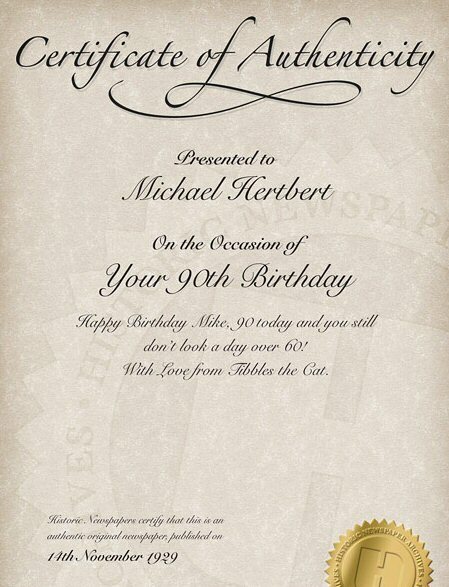 on the right, the occasion field was given as Your 90th Birthday). If you do not wish to include this on the certificate, then just leave this field blank. Message: This is the special message that is printed on the Certificate on the right. If you do not wish to include this on the certificate, then just leave this field blank.